July 19, 2018 - USNR has designed a new all-electric Stick-N-Stacker (Lunden style) that boasts many advanced features. You can take advantage of the newer technology through upgrades to your existing stacker. 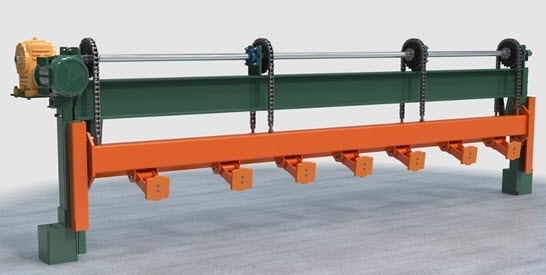 The Rake Off Assembly upgrade converts your system from hydraulic to electric, achieving a smooth operation up to 20 cycles per minute while maintaining ability to retract forks, even if boards are out of position, without damaging the Rake Off. “Safe zero potential” prevents Rake Off from falling even with broken chains!